Situational awareness ... The N.Y. Times' David Sanger reports: "In one of the darkest moments of the Vietnam War, [Gen. William Westmoreland] activated a plan in 1968 to move nuclear weapons to South Vietnam until he was overruled by President Lyndon B. Johnson, according to recently declassified documents cited" by Michael Beschloss in "Presidents of War," out Tuesday. You see this most vividly in politics, where the White House and Congress are often the cause and effect of the radicalization. You now see it in the courts and the Supreme Court, in particular, where a narrow, party-line vote made Brett Kavanaugh the next justice after a nasty, personal political brawl. Already, lawyer Michael Avenatti is calling for a new Democratic litmus test: increasing the size of the court to 11 from nine. Thanks to the Kavanaugh fight and the Merrick Garland shenanigans before it, there are three new fair-game realities: 1) The parties feel free to delay nominations a year-plus if necessary. 2) High school actions are "fair game." 3) Partisan-line votes for the Supreme Court are fine. 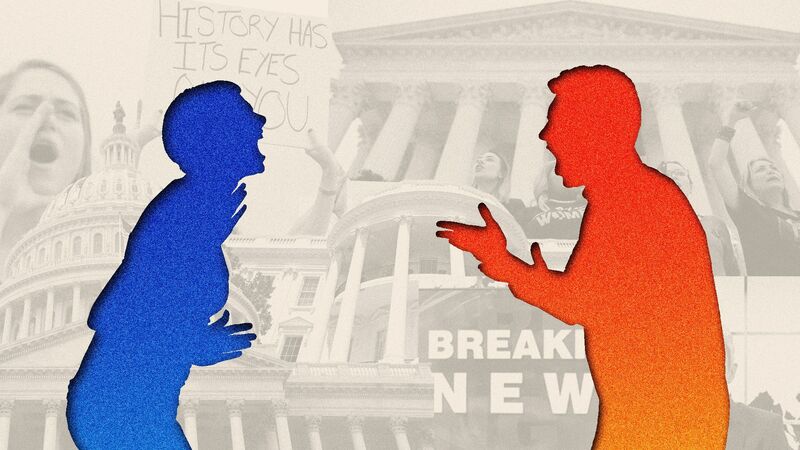 Watch for court fights to surpass congressional races in terms of partisanship. You see this in the traditional media, where the cable news networks are racking up record ratings around the sideshow of politics. Reporters, who previously kept their personal views private, suddenly pick sides on Twitter. Since the president's election, reporters on both sides of the political aisle, and from markets big and small, have shown less restraint on social media when it comes to their personal political viewpoints. Just this past week, a Minnesota journalist was fired from a local NBC station for wearing a "Make America Great Again" hat while covering Trump rally. A longtime Palm Springs anchor was forced to resign after defending Kavanaugh from sexual assault allegations. The New York Times conceded it made a mistake when the news story about a Kavanaugh bar fight at Yale was co-bylined by a writer who had tweeted her disapproval of the nomination. Since Trump was elected, by our colleague Sara Fischer's count, nearly a dozen reporters have either been fired or lost their jobs for incendiary social media posts, mostly all of them over politically-charged subjects. You see this on social media, especially Facebook, where the algorithm pumps endless partisan, emotional garbage into our faces all day, every day. People then jump to Twitter to duke it out. Sara has the data: A new study of hyper-partisan publishers, from social media analytics company NewsWhip, finds that the top Facebook Pages for mainstream political content were Fox News and Occupy Democrats, by a considerable distance. Both publishers have driven nearly 100 million engagements on their Facebook-native content for 2018 so far. On Facebook, the N.Y. Times’ Kevin Roose points out, many of the most engaged with posts on Facebook around Kavanaugh come from fringe, alt-right websites. Traumatic school shootings reignite a red-hot gun control debate. Deadly fires and storms stir emotion at first, then spark climate-change arguments. TV shows ("Roseanne"), sports (kneeling at NFL games), award shows (Robert De Niro’s “F—- Trump” intro at the Tony Awards), eating out (Republican officials heckled in D.C. restaurants). Be smart ... All the incentives on social media and in politics favor the radical: If you want clicks, viewers, donors, followers, retweets or votes, there’s no market for moderation or the middle. You might not have started the fire, but you’re surely living in it. 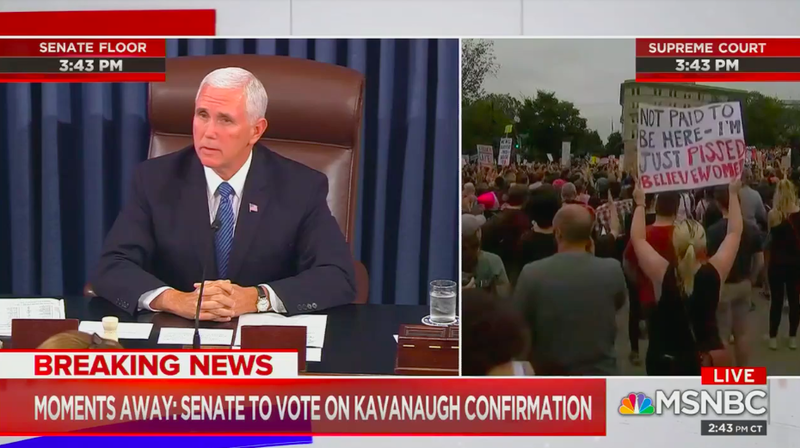 For more than five tense minutes, Vice President Pence — presiding over the 50-48 Senate vote for Brett Kavanaugh's confirmation as the 114th Supreme Court justice — intermittently banged the gavel and said over shrieks from demonstrators: "The sergeant at arms will restore order in the gallery." The disconcerting screams came in waves throughout the vote. On TV, they were muffled, as if someone were covering a microphone, and then clear. And again, muffled and then clear. 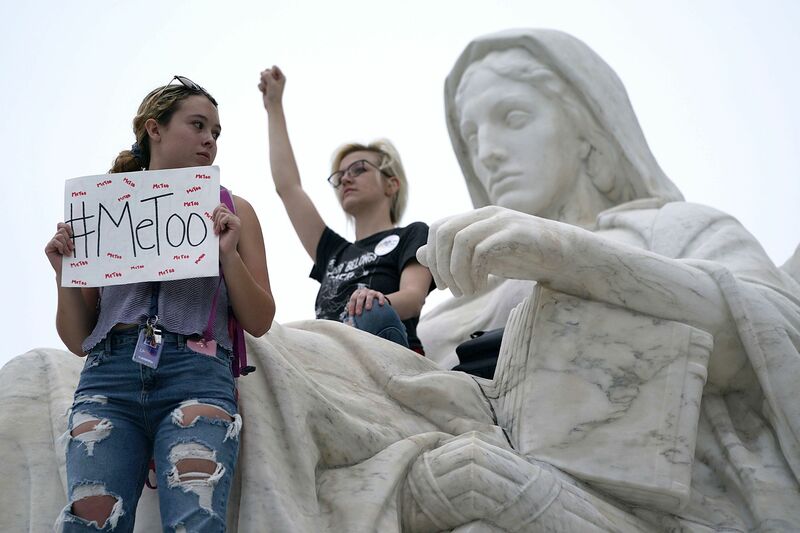 It was a fitting culmination of a process that further split an already divided nation — weaponizing the wounds of youth, but empowering so many women who had silently carried lifelong burdens. 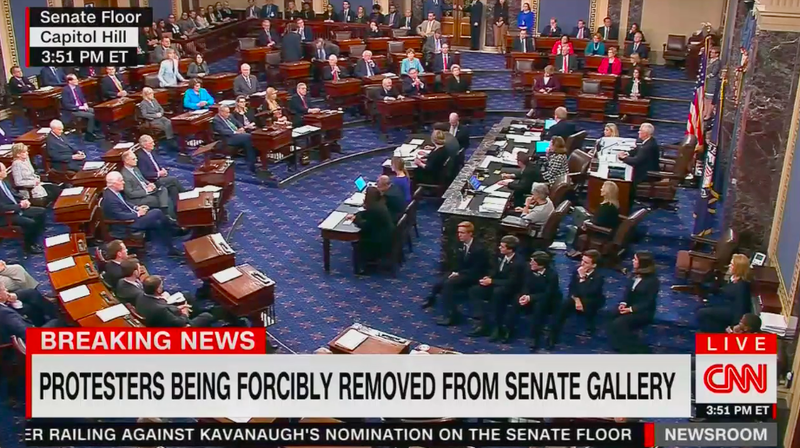 CNN's Dana Bash captured the nation's mood as cable coverage showed the Senate floor in split screen with a massive demonstration across the street at the Supreme Court: "So many times, we cover stories in Washington that people don't know about, people don't care about. Look at those pictures." 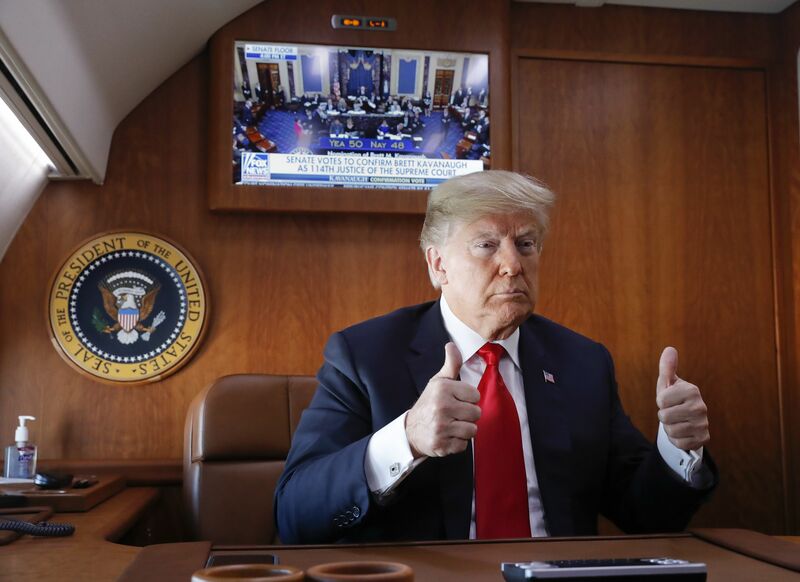 The last word ... Senate Majority Leader Mitch McConnell told the WashPost's Seung Min Kim: "I want to thank the mob, because they’ve done the one thing we were having trouble doing, which was energizing our base." 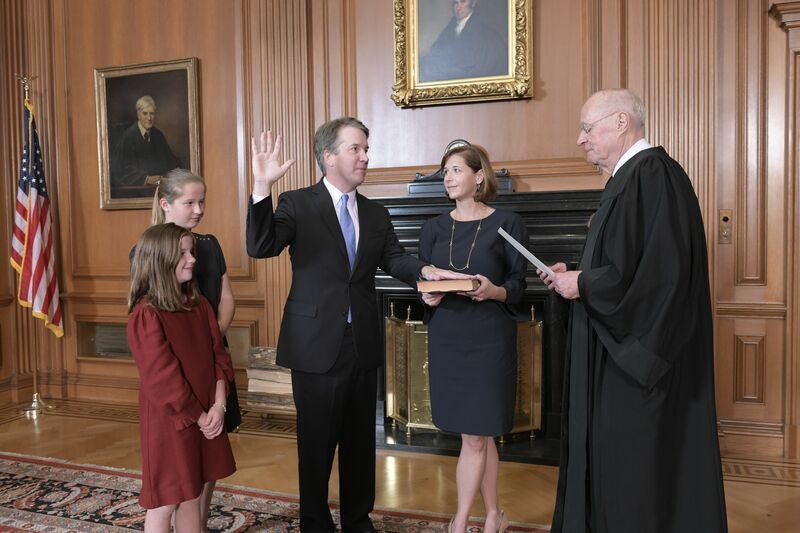 For the conservative legal movement, the swearing-in of Brett Kavanaugh "is a signal triumph, the culmination of a decades-long project that began in the Reagan era with the heady goal of capturing a solid majority on the nation’s highest court," the N.Y. Times' Adam Liptak writes. "[T]hat goal has been accomplished, and the Supreme Court will be more conservative than at any other time in modern history..."
Lee Epstein, a law professor and political scientist at Washington University in St. Louis: "We might be heading into the most conservative era since at least 1937." Why it matters: "The new majority is sure to move the law to the right on countless deeply contested issues, including abortion, affirmative action, voting and gun rights. And the victory will very likely be a lasting one. 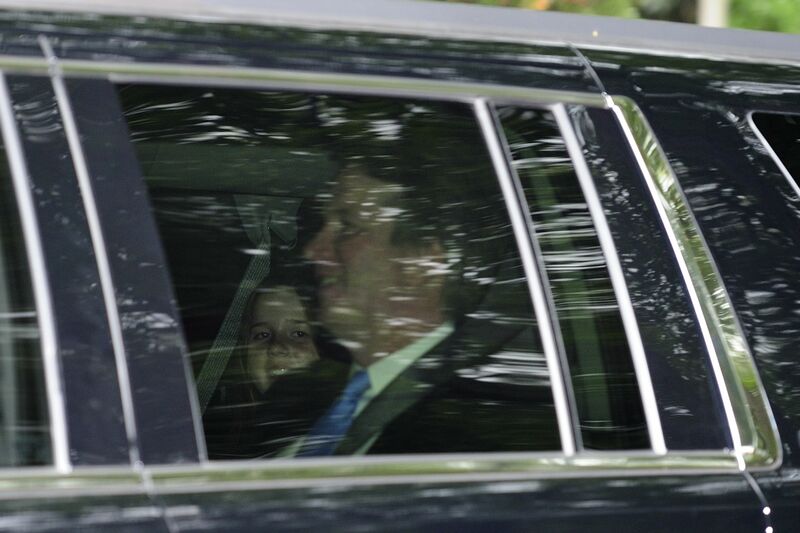 Judge Kavanaugh, now 53, could serve for decades." "The median justice now is ... likely to be conservative Chief Justice John G. Roberts." "[T]he proliferation of lawsuits from blue-state officials objecting to President Trump’s efforts to loosen environmental standards and impose tougher sanctions on immigration could fizzle." 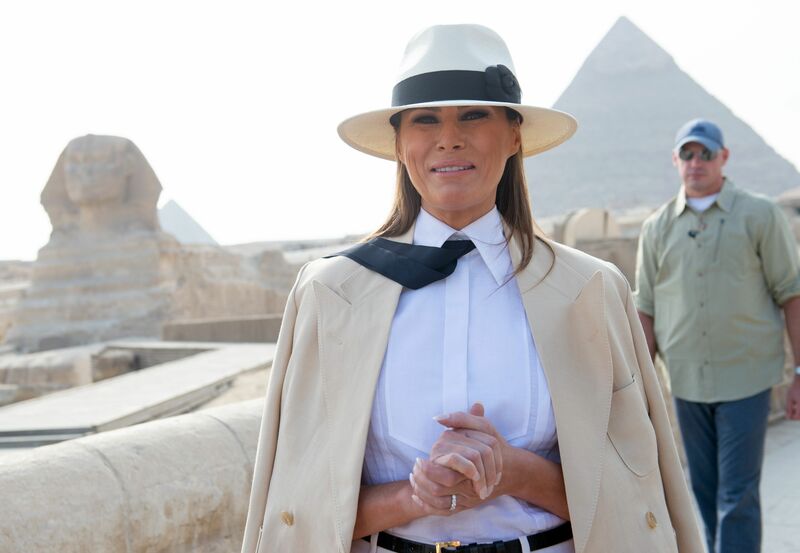 Melania Trump tours the Egyptian pyramids and Sphinx in Giza, Egypt, on the final stop on her four-country tour through Africa. "It took Melania Trump's first big solo international trip for her to show a different side of herself — a playful, less serious one," AP's Darlene Superville reports from Cairo. On President Trump: "I don't always agree with what he says and I tell him that ... But I have my own voice and my own opinions and it's very important for me that I express what I feel." Above, activists occupy the Contemplation of Justice statue in front of the U.S. Supreme Court. 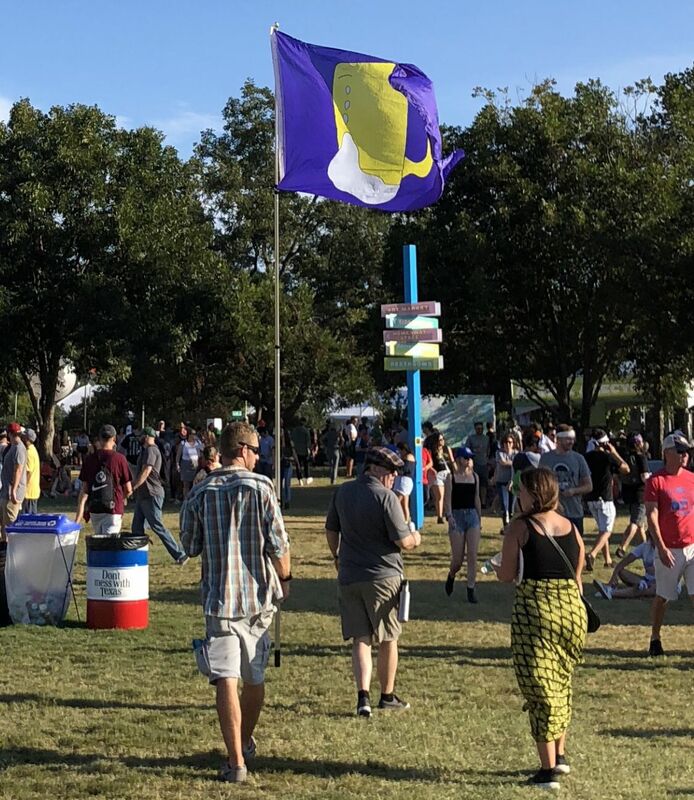 Below, an anti-Kavanaugh flag at the Austin City Limits music festival. "Harvey Weinstein has been charged with sexual assault in New York, and Bill Cosby was sent to prison in Pennsylvania." "A task force launched last November by Los Angeles County District Attorney Jackie Lacey to handle the surge in allegations against entertainment figures has taken up criminal cases involving nearly two dozen entertainment-industry figures. None has been charged." Why it matters: "The lack of prosecutions stems from a clash between the #MeToo ethos, which encourages victims to come forward years or even decades after abuse and harassment that they've kept private, and a legal system that demands fast reporting of crimes and hard evidence." 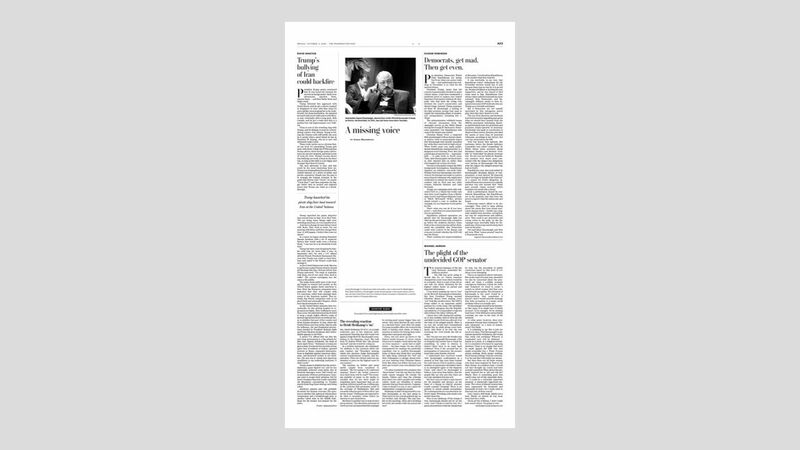 Friday's WashPost op-ed page had an empty space labeled "A missing voice," where a column by Washington Post Opinion writer Jamal Khashoggi might have gone. "Turkey has concluded that Jamal Khashoggi, a prominent journalist from Saudi Arabia [who contributed to The Washington Post’s Global Opinions section], was killed in the Saudi Consulate in Istanbul last week by a Saudi team sent 'specifically for the murder,'" the WashPost's Kareem Fahim reports from Istanbul." "Turkish investigators believe a 15-member team 'came from Saudi Arabia. It was a preplanned murder.'" "The killing, if confirmed, would mark a startling escalation of Saudi Arabia’s effort to silence dissent. Under direction from the crown prince, Saudi authorities have carried out hundreds of arrests under the banner of national security, rounding up clerics, business executives and even women’s rights advocates." "Khashoggi, a former newspaper editor in Saudi Arabia and adviser to its former head of intelligence, left the country last year saying he feared retribution for his growing criticism of Saudi policy," Reuters reports. "On Tuesday he entered the Saudi consulate in Istanbul to get documents for his forthcoming marriage. Saudi officials say he left shortly afterwards but his fiancée, who was waiting outside, said he never came out." That's the Salt Lake Tribune headline over the news that beginning in January, Mormons will be obligated to spend just two hours at church on Sunday instead of the current three. The 16-million-member Church of Jesus Christ of Latter-day Saints announced yesterday that a "60-minute sacrament service will be followed by a 50-minute class period after a 10-minute transition," Peggy Fletcher Stack writes. "Classes will alternate by week, with traditional Sunday school meetings on the first and third weeks of each month, and the faith’s all-male priesthood, female Relief Society and youth classes held on the second and fourth weeks." Currently, Sunday mornings include both meetings every week. Why it matters: "This change is meant to balance the roles of church and home in teaching Mormon principles." This photo shows a chicken house near Livingston, Calif. In November, California will vote on Proposition 12, which would set size requirements on coops and cages used to contain breeding pigs, veal calves and egg-laying hens, AP reports. 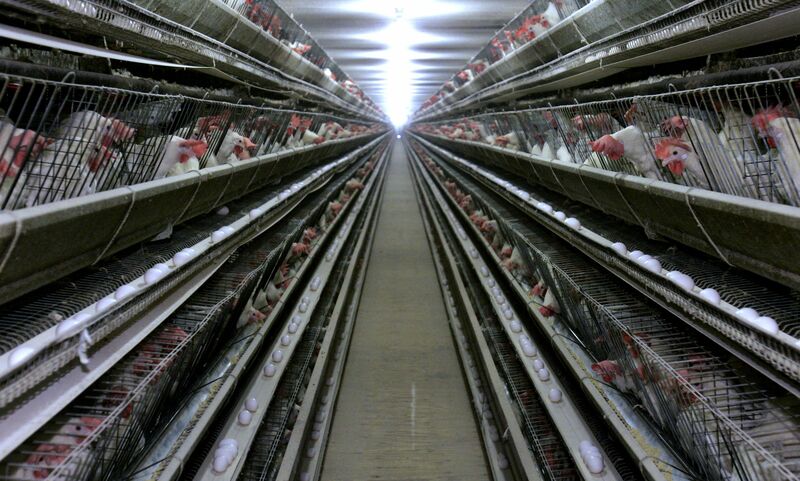 All egg-laying hens to be raised in cage-free conditions by 2022. The Association of California Egg Farmers opposes the measure, saying the expedited timeline could lead to supply disruptions, price spikes and a shortage of eggs for sale. In the "Saturday Night Live" cold open, "Dana Bash" (played by Heidi Gardner) reports live from the GOP locker room after the Kavanaugh vote. "Sen. John Kennedy" (Kyle Mooney): "Let's Ralph till we boof." "Sen. Susan Collins" (Cecily Strong): "The last thing I wanted was to make things about me."